Sewing machines have come a long way from the original Singers: they’re more accurate, with many new features and quieter motors. Some of the best sewing machines are still coming from Singer, but there are more options than ever for solid, high-quality sewing machines. Let us help you find the best sewing machine for your quilting projects with our sewing machine reviews below. Not sure how to pick the best sewing machine? Look for these handy features! Stitches per Minute: For large pieces, a fast sewing machine will help you finish the boring parts of your project faster! Serious quilters may want pro-levle speeds on their sewing machine. Auto Needle Threader: Where would we be without automatic needle threading? You don’t have to squint and do it yourself when your sewing machine has an automatic threader. Auto Thread Trimmer: Automatic thread trimming is one way to speed up the machine quilting process. This feature is useful for pro quilters! Extension Table: An extension table can be a great tool for quilters, so it’s a good feature to look for if you don’t have an extension table already. Dimensions: Looking for the best portable sewing machine for quilting? Pay attention to the dimensions to see if it’s a good fit for your workspace. Warranty: The warranty is a sort of guarantee from the manufacturer that tells you something about the quality of the product. Longer is better! You may notice quite a few sewing machines from Brother and Singer on our list. They’re some of the best sewing machine brands, so no surprise there! From industrial machines to basic options perfect for hobbyists and beginners, your perfect quilting machine is waiting for you on this list! By the way: If you’re in a rush, take a look at our top pick and budget pick! This sewing machine is optimized for quilters, especially large quilts, thanks to its 1,500 stitches per minute top speed. A knee lever lets you adjust the presser foot hands-free so you can make fine-tuned adjustments to your piece. The 12 by 18-inch extension table is also a quilter’s friend, giving you room to work with piecing together multiple squares. The automatic needle threader and thread trimmer will save you time, too. Several different feet types are included, as well as a seam guide and foot control. This machine does straight stitch only so it may not be as useful for other types of sewing projects or decorative stitching. It comes with a rolled hem foot, adjustable zipper foot, invisible zipper foot, quarter inch foot, and spring action quilting foot. These feet help you handle “problem fabrics” in quilting with ease! This is a relatively large sewing machine ideal for dedicated quilters. The Brother CS6000I lets you choose between using the included foot control and a stop/start button on the machine. An LCD screen shows your selected stitch and allows you to adjust the stitch width. Choose from 60 stitches for tons of different projects! The quick-set top drop-in bobbin makes setting up your bobbin easy and jam-resistant. It comes with an extension table that’s great for quilting projects, but this small sewing machine has a compact size that’s great for quilters with limited space. 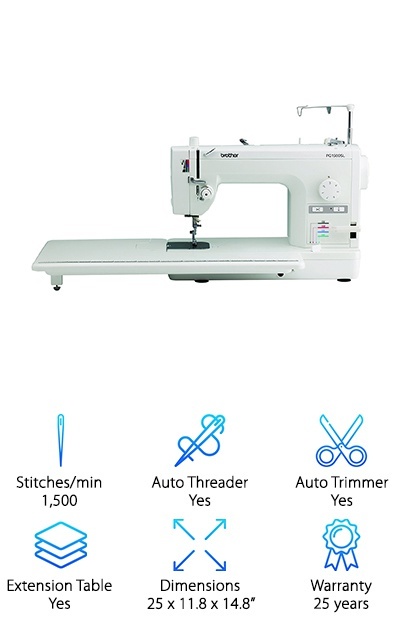 The sewing machine comes with a buttonhole foot, overcasting foot, monogramming foot, zipper foot, zigzag foot, blind stitch foot, button fitting foot, walking foot, and spring action quilting foot to handle tons of different sewing tasks! Perfect for highly decorative quilts as well as other sewing projects like upholstery covers or clothing. At 850 stitches per minute, it can sew along at a good clip while you set the speed. One of many amazing Singer sewing machine models, the 7469Q features an easy jam-resistant bobbin system and automatic needle threader. It has 98 built-in stitches, 13 needle positions, and seven fully automatic one-step buttonholes. 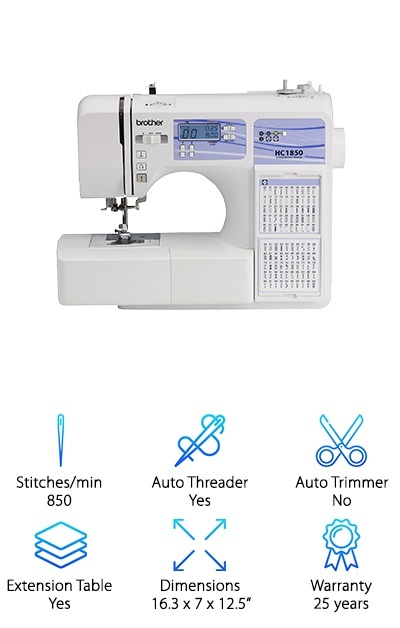 You can adjust the stitch length and width, and you have electronic twin needle control. The drop feed and programmable needle position helps speed up the quilting process and make it easier. It also comes with an extension table and four bonus quilting feet: a darning and embroidery foot, a walking foot, an open toe foot, and a ¼-inch foot. At up to 750 stitches per minute, it’s not as fast as our budget pick, but has a greater number of built-in stitches for a variety of projects. It’s also pretty compact, too, and cabinet-mountable. This machine is a great all-around sewing machine that can work for quilting projects and other sewing adventures as well. The Brother HC1850 has an 850 stitches per minute top speed and 130 stitches to choose from. An attached stitch flip-chart helps beginner and advanced sewers alike quickly reference different stitches. The machine even has basic monogramming stitches and a monogramming foot. An LCD screen tells you the stitch you’ve selected and the stitch width. 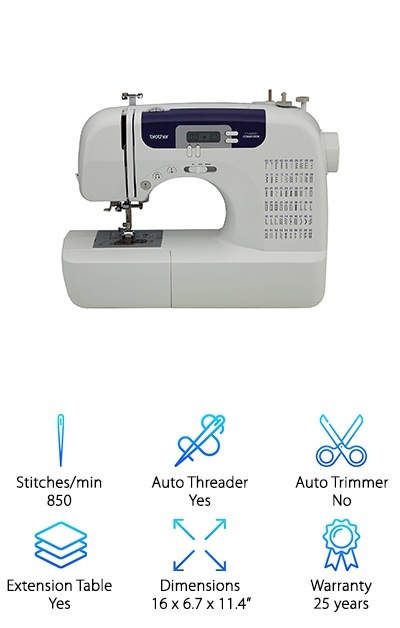 It comes with eight styles of one-step auto-size buttonholes and eight specialty feet for things like overcasting, blind hems, and quilting. An included extension table and spring action quilting foot are perfect for quilting. This machine also has 14 quilting stitch functions and free-motion quilting drop feed capabilities for an easy, breezy quilting project! 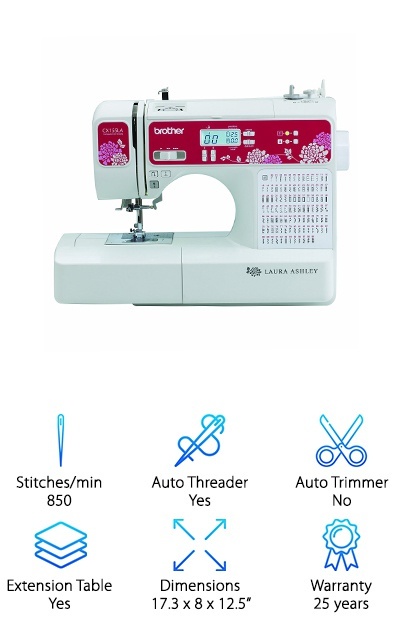 An automatic needle threader and quick-set bobbin design help you complete your projects faster. The feed system can handle difficult fabrics, and you can use the included foot control or controls on the machine depending on what works for you! 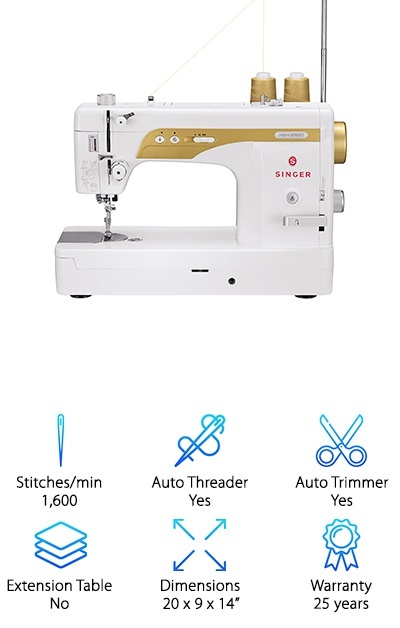 The Singer S16 has top speeds of 1,600 stitches per minute, making it an amazing industrial sewing machine for professional sewers and quilters. The knee lifter and programmable needle up/down features make piecing quilts an easier process. Automatic needle threading and thread trimming mean you don’t have to break the flow of your project! The machine comes with a quarter inch foot, a narrow rolled hem foot, a free-motion foot, and a darning plate. It is a little smaller in size than our top pick, making it a great choice for pro dress makers working with limited spaces. While it doesn’t have an extension table, the space to the right of the needle measures about 9x6 inches, giving you room to work on quilting projects. 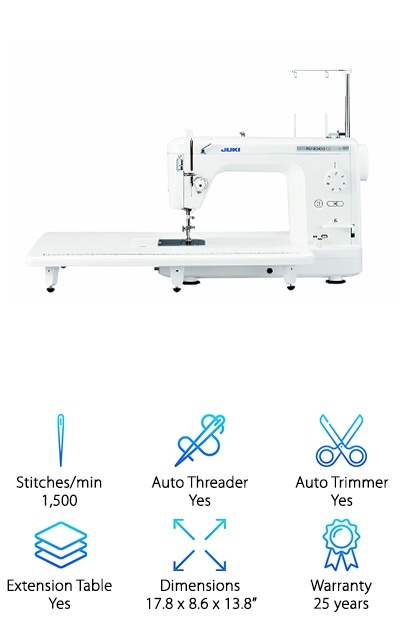 This is a true straight stitch sewing machine with tons of strength and quality behind it. The XR3774 has 37 built-in stitches with 74 total stitch functions, all at the speed of 800 stitches per minute. Sewing buttonholes just got easier with a one-step auto-size button-holer, too! The built-in needle, jam-resistant drop-in bobbin, LED lighting, quilting foot, and extension table are all great tools to have on your side for quilting with ease. The seven other included sewing feet are buttonhole, zipper, zigzag, blind stitch, button sewing, narrow hemmer, and walking feet. An instructional DVD can help you learn how to use the best features of the machine. This machine works well for sewing as well as quilting thanks to its range of features and average stitches per minute speed. It’s easy to operate and good for a range of sewing projects. It won’t hold up to industrial usage--it’s more for beginner and intermediate sewers, or people who find the machines with hundreds of stitches and other functions a bit overwhelming! The CX155LA Laura Ashley Limited Edition sewing machine has a vibrant floral design and a lot of great features. Included among the 155 built-in stitches are 55 alphanumeric stitches and eight styles of easy one-step buttonholes. An LCD screen lets you easily see which stitch you’ve selected and its settings, plus an extra-wide table gives you room for handling quilts! The eleven feet included are zigzag, buttonhole, zipper, button sewing, overcasting, blind stitch, monogramming, walking foot with quilt guide, quilt guide, ¼-inch piecing, and stitch guide. The result: a machine that’s great for sewing as well as quilting. The many stitch design possibilities can give you lots of options for embroidering your quilt. Great for beginners to more advanced sewers, whether for daily projects or weekend work. The computerized design is a good choice for nervous beginners since it will let you know if you’re doing anything that could mess up your project! Wait a minute, you’re thinking--this isn’t a Singer or a Brother sewing machine! Bear with us. The TL-2000Qi from JUKI features an aluminum die cast arm and bed to keep vibration to a minimum, an extension table, an automatic needle threader, an automatic thread trimmer, and a knee lever. The speedy 1,500 stitches per minute is what impressed us! Quilters love it for the true drop feed and stitch quality. It’s a semi-industrial sewing machine that can even hem denim jeans. 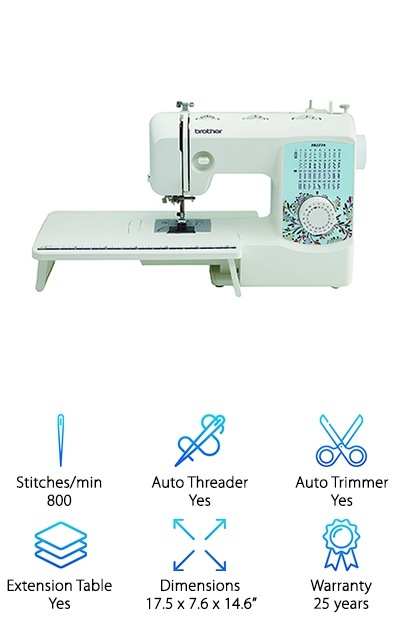 It comes with a free motion darning foot, a walking foot, straight stitch foot, a ⅕-inch quilting foot, and a zipper foot. Every piece of the TL-2000Qi is high-quality and built to last, perfect for dedicated quilters and heavy use! Beginners may find it has a learning curve, but people who prefer a mix of manual adjustments and computerized accuracy will appreciate the amazing production skills of the TL-2000Qi. Choose from 100 stitches and rocket off at 750 stitches per minute with the SINGER 7258. This small beginner sewing machine comes with ten presser feet that let you experiment with a variety of projects besides quilting. A display screen helps you keep track of your selected stitch and stitch settings. Use the Electronic Auto Pilot feature to adjust the maximum speed while sewing without the foot pedal. Hate buttonholes? 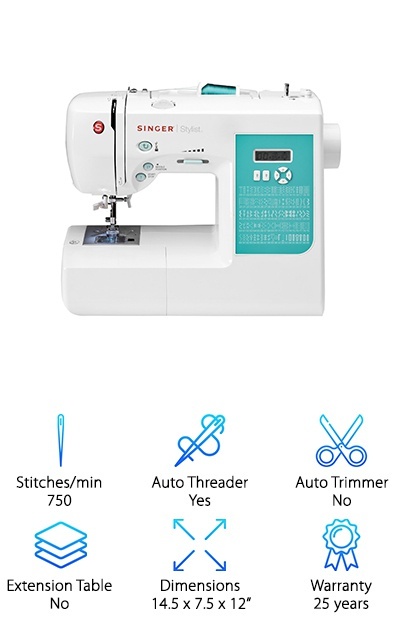 The Singer 7258 makes them easier with 7 included automatic buttonhole stitches. You can program the needle to stop in the up or down position for different projects, from quilting to appliqueing. The feet included are the all-purpose foot, zipper foot, buttonhole foot, blind hem foot, satin stitch foot, overcasting foot, darning and embroidery foot, gathering foot, rolled hem foot, and a ¼-inch quilting foot. A workhorse sewing machine for hobby sewers and quilters as well as beginners. The bobbin is easy to load, and you don’t have to thread the needle yourself--what’s not to love? 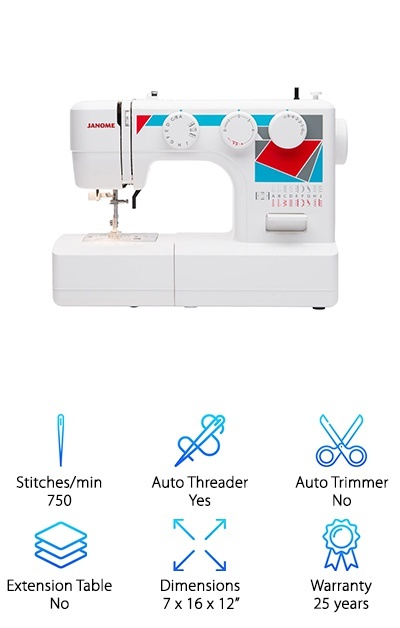 Another outlier among our favorite Singers and Brothers, the Janome MOD-19 includes a range of basic features that beginners or those with simple sewing projects may enjoy. A four-step buttonhole stitch is included among the 19 stitches, and the built-in needle threader means no more squinting! You can adjust the stitch length and width and use the drop feed system for free-motion quilting and sewing. There are four presser feet included, compared to some of the machines on our list with close to a dozen! Sew a lot of buttonholes? You may prefer one of the machines with one-step buttonhole stitches just to get it over with more quickly. This is a quiet and effective sewing machine. If you’re looking for simplicity, you’ve found it! Beginners will find it easy to learn from while still producing quality stitches, and if tons of extra features give you a headache, you’ll like the MOD-19, too!